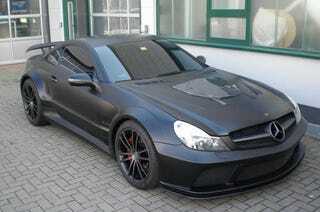 Start with an already-tuned-by-AMG SL65 Black Series, fit it with larger turbos, huge brakes, a new transmission, then wrap it in black vinyl and put some weird plastic on the hood. Voila, the Brabus Vanish — an 800 HP SL. The Mercedes SL65 AMG Black Series tunes the 6.0-liter twin-turbo V12 of the plain Jane SL65 AMG up to 670 HP and drops the weight 551 pounds thanks to a carbon body, raising the top speed to 199 MPH and dropping the 0-60 time to the mid three second range. Only 350 will ever be made. Now, enter Brabus and combine them with a presumably wealthy resident of Dubai and you have the recipe for what they're calling the Brabus Vanish. The biggest "problem" with the regular Black Series is that the transmission can't handle the engine's max torque of 885 Lb-Ft, so it's restricted to 737 Lb-Ft. The new transmission solves that problem while two larger turbos presumably even increase it.